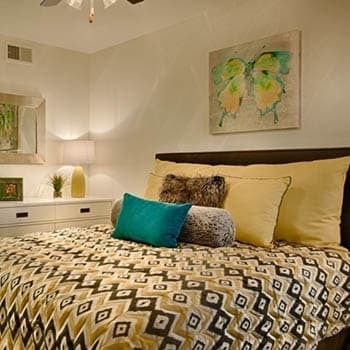 Our thoughtfully designed one and two bedroom apartments in Scottsdale, AZ, provide the perfect framework for your unique style. Like the breathtaking Sonoran Desert, the deep beauty of Cabrillo Apartments comes through in the details. Wood-style plank flooring, tile accents, contemporary window coverings, and handsome kitchen cabinets lay the groundwork for your personal imprint. It’s easy to maintain your chic with plentiful storage, a gourmet kitchen, and in-unit washer and dryer. Create your ideal atmosphere with programmable temperature control or step out into the open air to your private patio or balcony.